We appreciate your interest in Erney Landscaping – Lehigh Valley Landscapers located in Zionsville, PA. Since serving Allentown, Bethlehem, Easton and the surrounding Lehigh Valley area, we have been happy to provide landscaping design and property needs services. We also specialize in a variety of maintenance services, including lawn treatment, yard maintenance, and lawn fertilizing. As an award-winning landscape designer with years of experience, we take landscaping to a whole new level. With creative and innovative designs, we make your backyard stand out from the rest and take your ideas into consideration to make it personalized. Our landscape designers will work with you every step of the way, providing you with a design that meets your needs and fits your personality. If you want an award winning landscaping company who will give you the in-depth service that brings you a design like no other, choose Erney Landscaping. The following list of professional lawn care services is what we excel in. Please feel free to contact us. Landscape and Garden Planning – Tailored for your property’s needs to create timeless effects and have your investment grow with your landscape. Hardscapes (Patios, Walkways, Retaining Walls, Boulder Placement Specialists) – Outdoor living spaces designed for comfort and entertainment purposes and also to help pedestrian traffic navigate through property’s gardens. 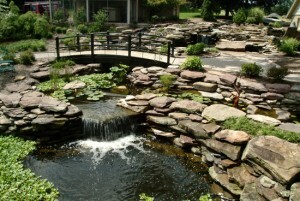 Water Garden Designs (Fish Ponds, Pondless Waterfalls, Formal Ponds) – Beautiful, tranquil way to relax in seclusion. Water Gardens are usually accompanied by patios, retaining walls, planted gardens. We use existing site conditions to create mini-ecosystems where plants, animals, birds, people and water live in harmony. Custom Decking – Exceptional application for elevated grade changes at house in conjunction with patios, walkways, hot tub pads and surrounding gardens. Cedar or composite surfaces available along with shade structures. Landscape Lighting – Low voltage lighting will provide evening accents to your landscape. Swimming Pool – Poolscape design for pedestrian roaming ability and soft garden accent. Water runoff and drainage conditions are pertinent in choosing pool site. Total Renovations – Removal of existing landscape or just pruning and re-conditioning beds can dramatically enhance your property’s appearance. Landscape Maintenance Service – Erney Landscaping is committed to the Design, Build, Maintain philosophy. We will continually maintain your project and property through all seasons to keep a clean, manicured appearance, including lawn mowing, bed renovations, shrub pruning and seasonal cleanups.